Print the Adobe PDF version of the Information Package and Application and submit by mail or apply online. The PDF files require Adobe Acrobat Reader to open, which can be downloaded for FREE by visiting the Adobe website. Miss Achievement Newfoundland and Labrador is an Incorporated, not-for-profit scholarship program. 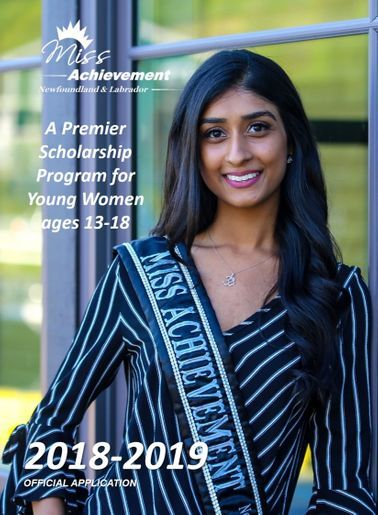 We provide the province's largest scholarship program for young women, which awards individuals for academics, promotion of healthy living, public speaking, community service, volunteer work, environmental awareness and performance-related talents. Our participants are inspirational and exciting celebrations of achievement, talent and imagination, who provide unique and exemplary contributions to their schools and communities. Since 2006 we have awarded over $100,000 in scholarships to deserving young women.